Origin and Habitat: Tafna, Jujuy, in the Argentina/Bolivia border. Altitude range: 3600-3700 metres above sea level. Description: Rebutia eos is one of the varieties of Rebutia pygmaea which is a very variable taxon with several collected extreme forms that were early published as full species or as varieties, but these were too weak botanically to stand, so they are all combined in Rebutia pygmaea. 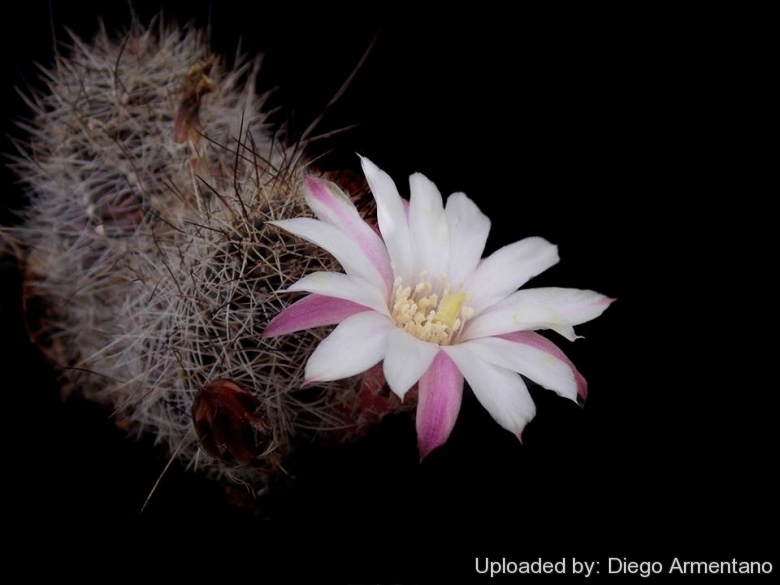 Habit: Rebutia eos is a miniature cactus with greyish-green body, brownish spines, darker central spine and flowers varying in colour from pure white, over white with pinkish centre to the beautiful pink flowered form also known as Rebutia eos var. roseiflora Rausch n. prov., ( field number R 333a), however pure white to pink flowers may occur in the same plant. In cold weather on the first day the flowers are often bright pink, but turn white on the second day. In hot weather the blossoms tend to be pure white from the first day. Stem: Solitary, or rarely branched, short columnar, 30 mm tall and 20 mm wide, brownish-green. Ribs: 12-13 straight or slightly twisted barely noticeable, broken into blunt tubercles about 4 mm long. Areoles: Oval, 2 mm long, with brown wool. Radial spines: 6-10, up to 6 mm long, bristle-like with a brown base. Central spine: One (sometimes missing), up to 55 mm long, stronger, brown to black, pointing upward. Flowers: About 40 mm long and 30-40 mm wide; perikarpel spherical, reddish-brown, with dark brown scales. Receptacle pink, hairless below; above dark green, with lanceolate scales bearing white hairs in the axils. Outer perianth segments white, with brownish central stripe. Inner perianth segments, white or pinkish. Pistil and stigma pale green; stigma-lobes pale green or creamy-pink. Fruit: Brown with dark scales, covered with white wool. Seeds: Bell-shaped, testa brown, matte. Taxonomyc notes: Rausch described this plant in1970, and in 1972 he called it Rebutia eos and in 1987 Lobivia haagei var. eos. In 1992 the CITES list regarded it as a synonymous of Lobivia atrovirens and in "The New Cactus Lexicon" (2006) David R Hunt; Nigel P Taylor & Graham Charles integrated this taxon into Rebutia pygmaea. 1) Rausch, W. “Rebutia (Digitorebutia) eos Rausch spec. nov.” - Succulent 51: 2-3; 1972. Cultivation and Propagation: Rebutia eos is a summer grower species that is easy to cultivate and recommended for beginners. It has delightful flowers and the plants remain compact, and clumps can easily be managed by division. Another advantage is that the plants are very cold hardy in Winter if kept dry.